Whenever pudding is on sale at the store, I grab some up for the kids. Typically the usual fare such as chocolate, vanilla, or the combination. Not too long ago, I decided to throw in the classic tapioca pudding to see if there were going to be any takers. There was one who had high interest, only due to the fact that the chocolate and vanilla puddings were already taken. When he asked me what it was, I said ‘pudding, try it’. He tore into it, looking at it, nibbling on the spoon, much like we probably did as kids (I really liked tapioca pudding growing up, or any pudding besides butterscotch), but then he just scooped it up like there was no tomorrow. That’s when I decided I would make a batch of my own tapioca pudding and get their take on it. Success? Yes, and with a gentle and awesome twist. Start by soaking the tapioca pearls in room temperature water, overnight. The next day, drain the water from the tapioca, give a gentle rinse, and drain again. Reminds me of making sticky rice believe it or not. Set aside, then warm up your milk. You do not want the milk to come to a boil, rather just before a boil is ideal, so keep an eye on it. Once the milk is warmed through, add in the salt, and the tapioca pearls. Give a good stir, keeping an eye not to boil the milk. Once the milk begins to slightly bubble on the sides of the pot, reduce the heat to very low heat, and cook those tapioca pearls for 60 minutes, making sure the the milk never comes to a boil. During this time, separate your egg yolks from the whites, making sure to reserve both. 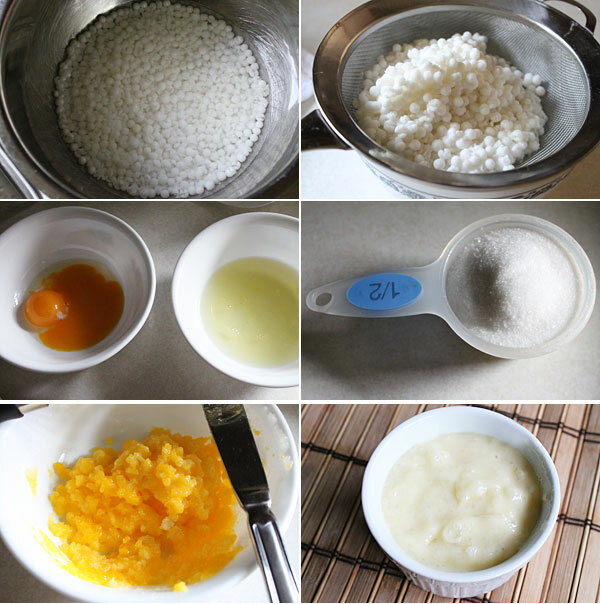 Add the yolks to the bowl of sugar, and mix that together to form a nice paste. Now it is time to gently mix in some of the hot milk mixture to the sugar and yolk mixture. This is called tempering. The goal is to warm the yolks through without scrambling them. You can use a couple of tablespoons of that milk mixture, slowly, to achieve that process. Once you have that ready, add this mixture to the pot of milk and tapioca pearls and give a good stir. Next, turn up the heat and give a good stir, cooking for about 15 minutes or until the tapioca thickens. During this time, take those reserved egg whites and beat the crap out of them until you have nice, stiff egg whites. Once stiffened, slowly stir those into the cooked tapioca, adding the vanilla extract as well. Pour into serving bowls, and place into the refrigerator to completely cool (unless you like warm tapioca, that’s your call). Now the fun part, at least for me, and the kids. 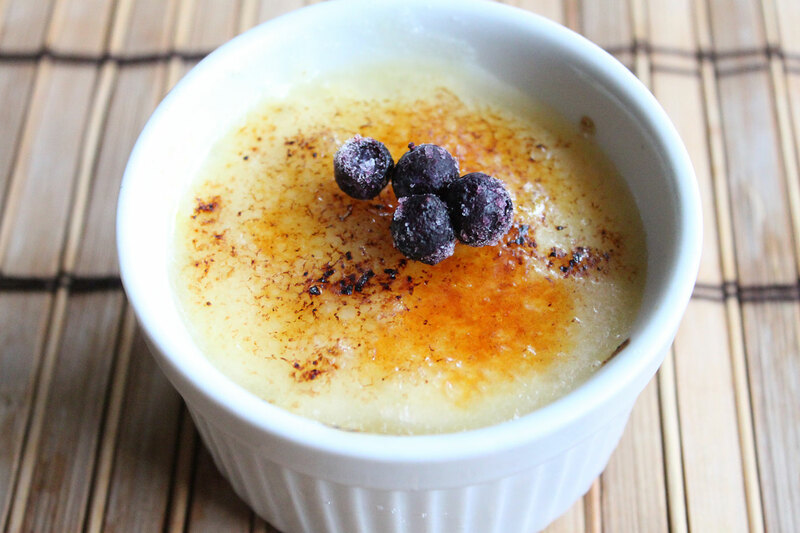 Add some fine sugar to the top of each tapioca bowl, get your kitchen brulee torch out, and caramelize the top of the sugar. Once done, add some blueberries (I used frozen for texture), and dig in. Was this ever a fun treat? Heck yes! Did the kids love it? You betcha! Was it worth the time, effort, and expressions on their faces? Absolutely. If you are wanting to make some tapioca, give this one a try, especially bruleed as it was cool, refreshing, and delicious. Hope you enjoy!